Jesus said, "If you do a good deed, try to forget it, for it abides with Him who will not forget it." `Abdallah ibn al-Mubarak, al-Zuhd, p. 101 (no. 301). Commentary: another quotation of Jesus preserved in Muslim sources. 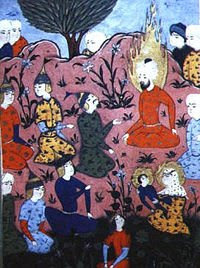 Jesus delivering the sermon on the mount in Islamic art.